The second bottle of wine that we killed on the occasion of George’s move to the west coast was this one–the 2000 Hayman & Hill Meritage, a red bordeaux blend from Monterey County on the Central Coast region of California. It followed a great bordeaux from France and had little trouble muscling up for our taste buds. 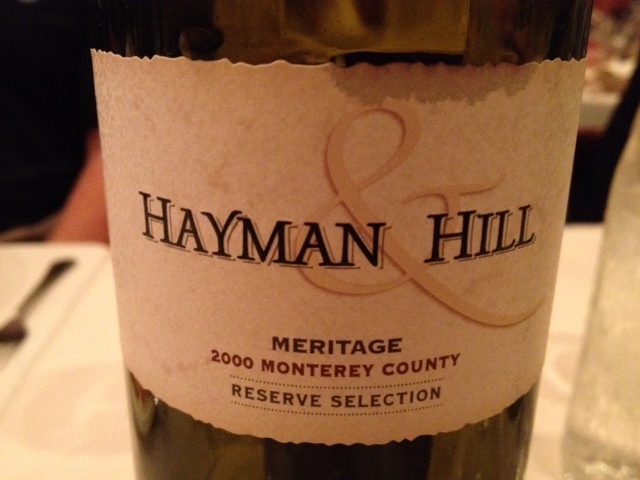 2000 Hayman & Hill Meritage – Monterey County, from the Central Coast of California, USA. My brother from another mother always picks great vino for every event, and this one was right on point. Most had pasta entres and I think this worked well for them; it definitely went well with my fish special and my garlic mashed. I haven’t included any winemakers notes in this particular summary but will look forward to having another bottle in the future–and at that time I’ll be sure to add that info to our NON. This entry was posted in Bordeaux, Red blend and tagged USA.